This was an idea dreamt up by the Chapter Safety Officer, Peter “Scottie” Scott. 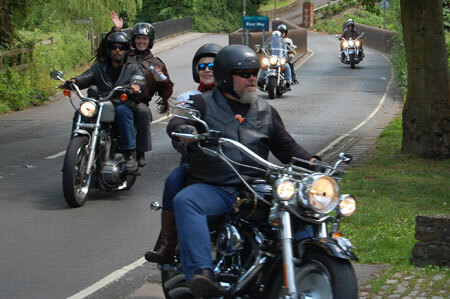 Another excuse to get C&F (and Meridian members) out into the beautiful Surrey countryside riding the world’s best motorcycles. Of course, the weather was carefully arranged so that there was nary a cloud in the sky. Regrettably, Scottie managed to double-book himself, so in the end a team of C&F Road Captains took over the running of the event, and like the Chelsea Picnic of previous years it turned out to be very good indeed. We got together the Thursday before and decided who was doing what. Les Channing was chief time-keeper, Nick Deal would supervise the arrivals and I would do the briefing and generally act as ‘chef d’escadron’. 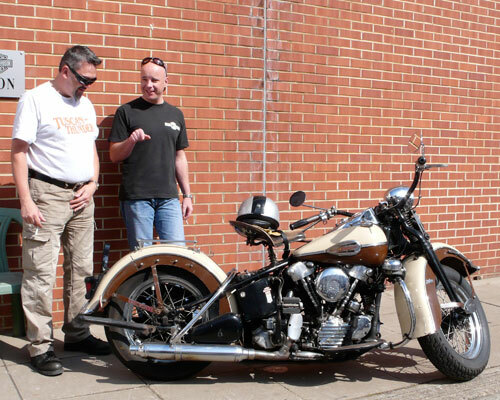 On the day John Warr opened the shop and brought breakfast, riding a magnificent old cream and brown 61 cubic inch Knucklehead, and Rob Warr came out on the run on his gleaming new CVO Springer. The picture above could have been used either for Putney as a town or Wandsworth as a Borough. 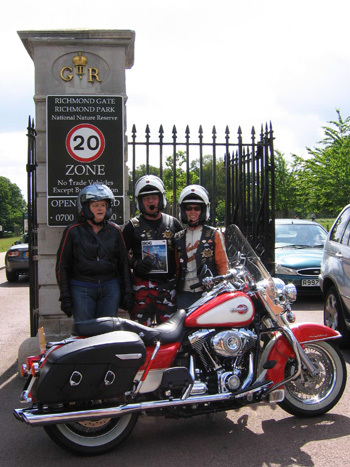 Diligent research revealed that between Warr’s at Kings Road and our destination at Elstead there were a minimum of 86 towns and villages, ranging from Abinger Hammer to Wonersh, 11 Surrey districts, 6 London Boroughs, and 2 qualifying parks (Richmond and Bushy). To make it manageable there was a 2.5 hour time limit, with anyone arriving more than ten minutes early or late suffering a penalty on their score. I positioned my bike at the car park entrance and sat down to wait for the rumble of approaching Harleys. All had arrived by 1pm, so the event kept well to time. First, with 23 points and the winners (by being closest to their target time) was the group of Mike George, Mark Sandiforth, Roger Black and August Jakobson. Second, also with 23 points, but not quite as accurate on time, was the John Castleman group, with Relvin Rapley, Ian Howard and Mark Courval. Third, on 16 points, were Gavin Caddick and Frank Linehan. Use or non-use of GPS seemed to make no difference, as Andrew Papas and David O’Flaherty were actually last! Prizes, kindly supplied by Warr’s, were then distributed to general acclaim. See you next Sunday for the Meridian Battle of Britain Memorial run - will we be as lucky with the weather? Bring a picnic!